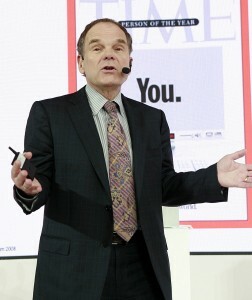 It’s been 20 years since Don Tapscott wrote The Digital Economy — the first best seller about the Internet. In 2014, a 20th Anniversary edition of the book will be published. This year Tapscott reflects on what has occurred and the next 20 years. He argues that the corporation is undergoing the biggest change in a century. Due to deep changes in technology, demographics, business, the economy and the world, we are entering a new age where people participate in the economy like never before. This new participation has reached a tipping point where new forms of mass collaboration are changing how goods and services are invented, produced, marketed, and distributed on a global basis. This change does not wreck corporate profit. If understood, it presents far-reaching opportunities for every company and for every person who gets connected, in both the developed and developing world. As one of the world’s leading thinkers about the role of technology in business, Tapscott discusses insights from his book Wikinomics: How Mass Collaboration changes Everything. He explains how a “Perfect Storm” of four drivers for change is creating the first category-6 business storm. An economic revolution — the global unbundling of the vertically integrated corporation into networks. The conclusion? A new enterprise is emerging — one that innovates, creates value, orchestrates capability and builds relationships differently than the corporation that has dominated the 20th century. These new enterprises compete better and grow faster than the old model. But how can firms find the leadership to make the change?